This Lowell, MA artist loft at Western Ave Studios has large windows overlooking the Western Canal and a raised platform sleeping area . The interior design for this open concept living space was created using the clients existing furnishings. 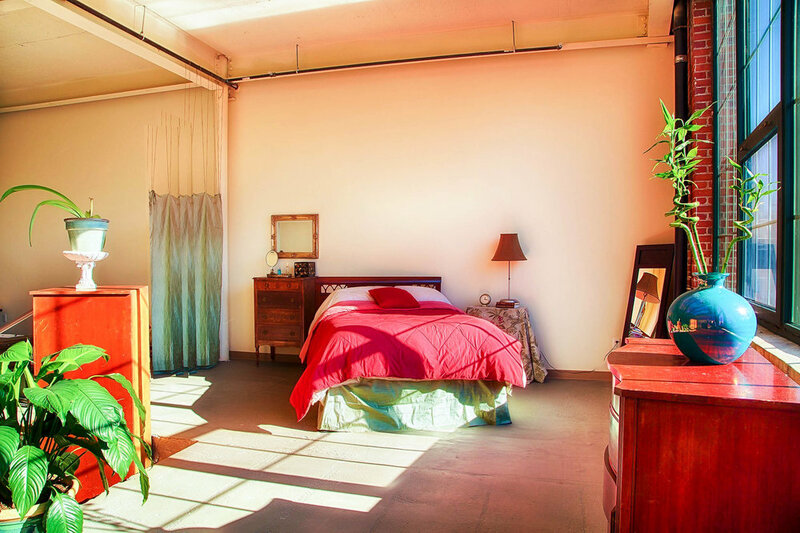 A bright spacious artist's loft with a raised platform that delineates the bedroom from the rest of the space. Oak treads on the stairwell leading to the sleeping area. This bedroom design uses curtain side panels hung from ceiling pipes to create privacy within the loft. Large windows provide a view of the Western Canal. The furniture was owned by the clients prior to design. Client provided accessories, artwork and lamps bring an eclectic feel to this bright open loft. An existing area rug is used to ground the seating space in the living room. The wall collage is a mix of art and mirrors.